If you are a new customer joining after September 4, you will automatically see the new look of GoToWebinar. If you are an existing customer, you will need to opt in from your GoToWebinar account. Click the robot hiding behind your upcoming webinars. To try out the fresh GoToWebinar look, click Try it now. This will launch the new experience of GoToWebinar in another browser page. 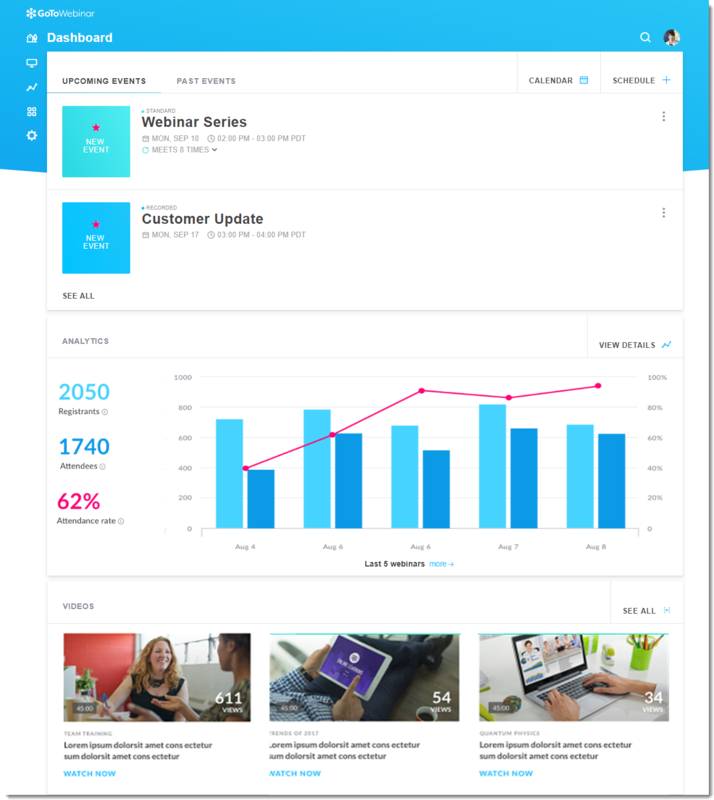 The Dashboard includes a list of your upcoming and past webinars, your overall webinar analytics, and your videos (event recordings). This new Dashboard simplifies managing webinars and improves usability and responsiveness. Enjoy! GoToWebinar offers multiple types of webinars to suit your needs, each of which offers different join experiences for attendees. Each time you schedule a webinar, you'll be able to choose which type you want to use. Learn how you can schedule a webinar. Standard events (formerly called "Classic webinars") are fully interactive events that are hosted live by the organizer. Learn more. Webcast events are similar to standard events but allow organizers to host large, broadcast-style sessions with up to 2,000 attendees (available for higher tiered plans) in listen-only mode. Learn more. 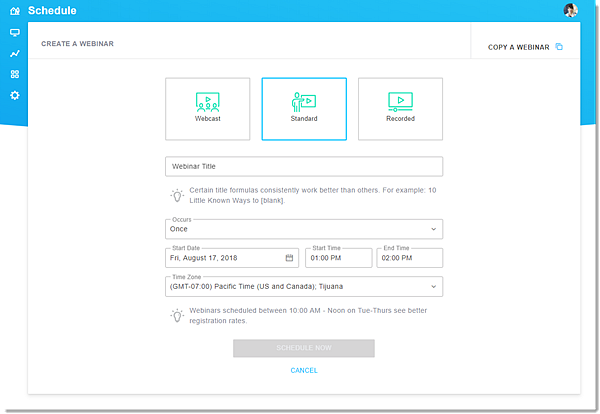 Recorded events (formerly called "Simulated Live webinars") are semi-interactive, pre-recorded events that start automatically and run on their own, so organizers do not need to be present to host the webinar. Choose this event type if you want to re-purpose your best recorded live event and then replay that recording with interaction multiple times! Learn more. After scheduling an event, you will be taken to the Event Details page where you can customize it. This includes inviting panelists, managing attendee registration, adding ways to engage attendees with polls and surveys, and more. Learn more on how you can customize your webinar. You can easily start and practice your webinar from the web. Keep in mind that you can start webinars at any time and as many times as you'd like, making it easy to practice ahead of time! While in practice mode, you will see the option to start the live broadcast to attendees. From the Dashboard, find the event you'd like to start. You can start the event in the following two ways. Learn more on how you can start a scheduled webinar. Click the More icon next to the webinar and click Start. 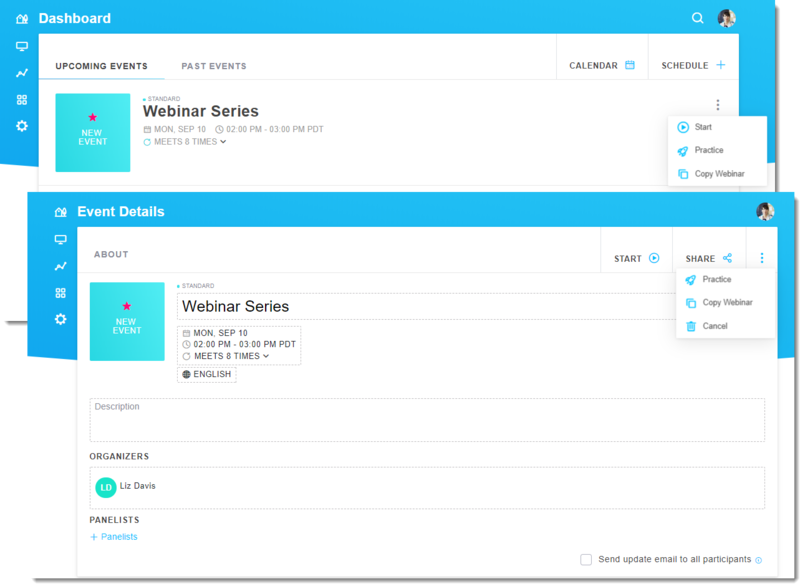 Open the webinar to the Event Details page and click the Play icon. From the Dashboard, find the event you'd like to practice. You can either open it to the Event Details page or remain on the Dashboard. Click the More icon and then Practice. The GoToWebinar desktop application will automatically launch you into session in practice mode (as indicated at the top of the Control Panel). You can start a live webinar while in practice mode by clicking Start or Start Webinar. Learn more on how you can practice a webinar. 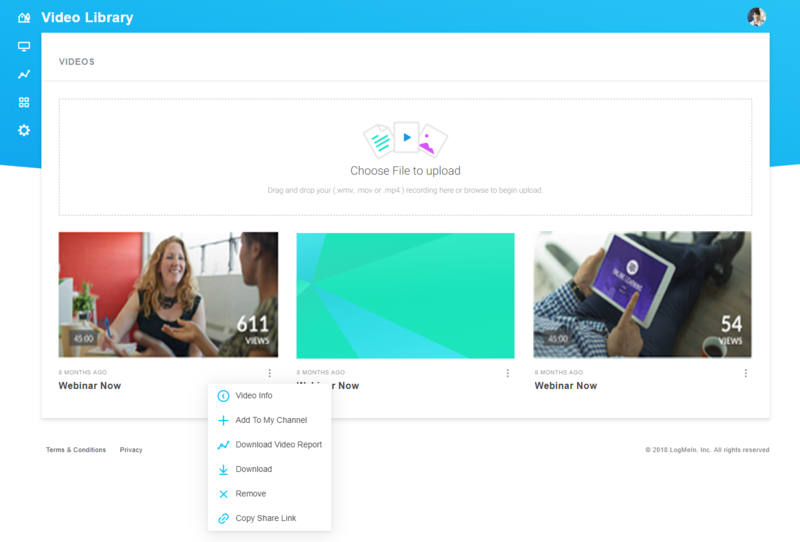 Manage your videos from the Video Library! From the Dashboard, click the Video Library icon in the left menu. You will see a list of all your available videos and their thumbnails. On the desired video, click the More icon to access the following features. Learn more on how managing and sharing recordings. Your Channel is a one-page hub for on-demand webinars. Every recording that gets published to your Channel page will show up on GoToStage.com, which is our video platform for content. This is an opportunity for your business to reach the 60 million professionals who join GoToWebinar events each year. Generate awareness and leads by sharing your videos on GoToStage! Access your GoToStage Channel page by clicking the Monitor icon in the left menu. 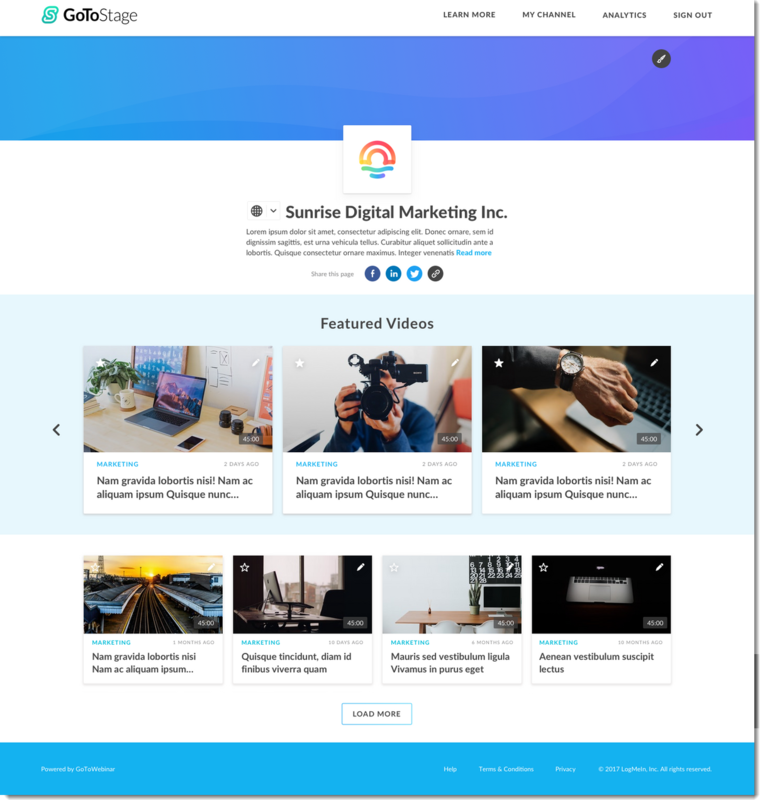 This will launch another browser page with your Channel page. Learn more. The Analytics page is a one-stop shop for all data-driven items. 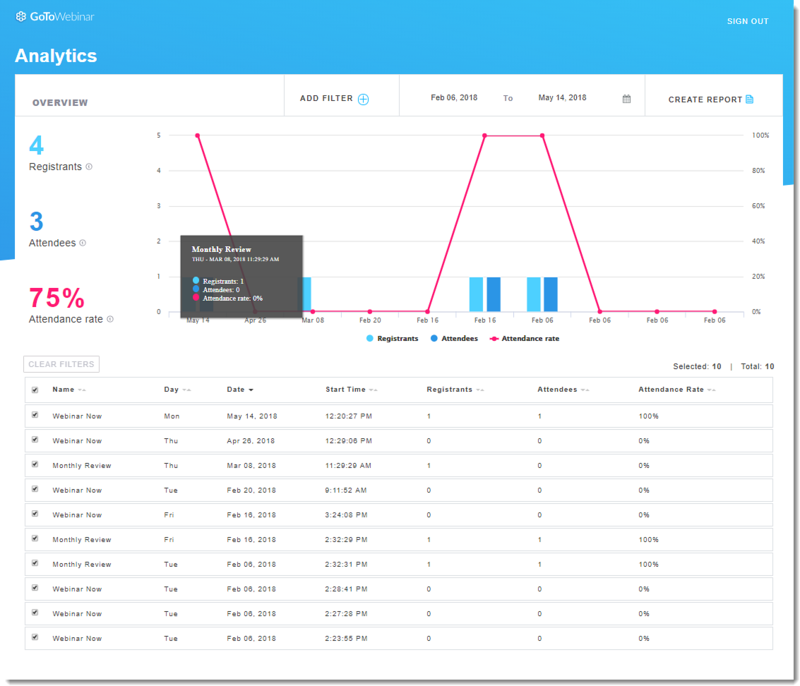 You can get high-level analytics of your webinar history in easy-to-read charts and generate reports, which is handy when you need details on your sessions (attendee information, Q&A, and more). After each event, the Analytics page will be updated with an overview of the attendee activity that occurred during the session. This includes the total number of registrants, total number of attendees, and the attendance percentage rate. From this page, you can filter out webinars by registrant and attendee numbers, and by customized date range. Learn more about webinar analytics. Depending on what details you're looking for, you can choose from several different types of reports to generate. Click Generate Report towards the top right to access and download the following reports in Excel, CSV, and PDF file types. Learn how you can generate a report. Sessions Overview Report shows a high-level overview of the webinar. Attendee Report shows details about each attendee including registration information and how long they attended the session. Performance Report shows high-level statistics on the session. Survey Report shows the session's survey questions and attendee's answers. Q&A Follow-Up Report shows details about questions asked by attendee and any answers during a session. 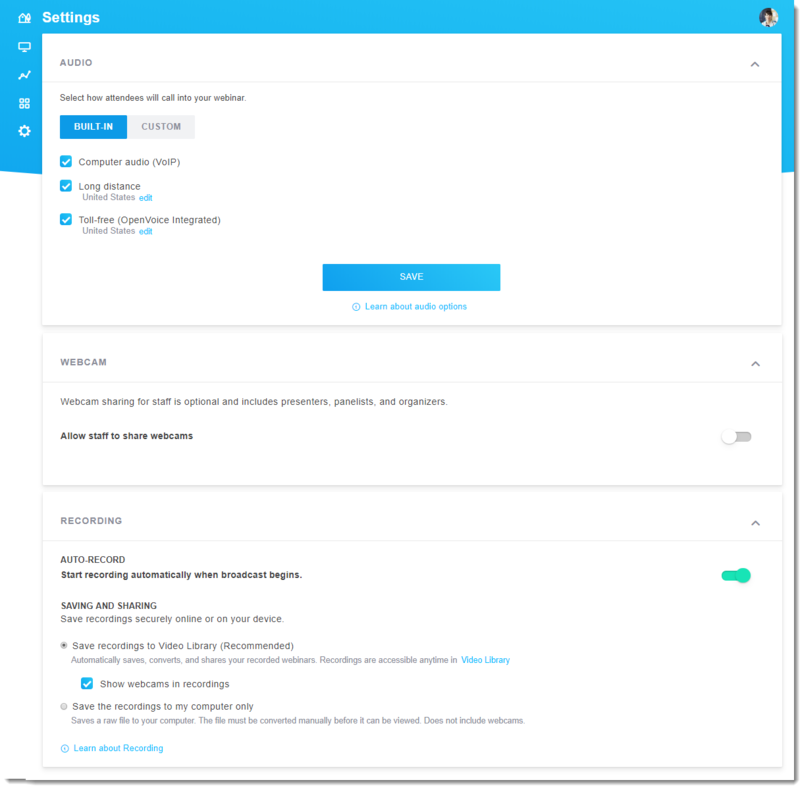 You can change various settings that affect the way your webinars are scheduled and run using the Settings page. These settings will apply to all sessions that you schedule. Learn more on configuring default settings. Each time you schedule a new session, it will automatically use the default audio settings configured for your account (but you can change them for each specific session as needed). You can choose between built-in audio and your own conference call service. Buit-in audio provides your attendees with multiple connection methods - computer audio (VoIP), long distance toll numbers, and toll-free numbers (OpenVoice Integrated). You can change the countries for which phone numbers are provided by clicking Edit. Custom audio allows you to use your own conference call service. All you have to do is enter the conference call information of your third-party audio service for attendees, organizers, and panelists. 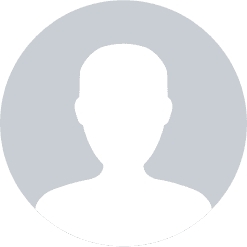 If you'd like staff members (organizers and panelists) to share their webcams during a session, toggle the Allow staff to share webcams button to the "On" position. Manage your recordings from this field. You can record any session and then store the recording for attendees to view at a later time. The session recordings include the presenter's screen, audio, and any shared applications. Enabling auto-record allows the desktop app to automatically start recording the webinar as soon as the broadcast begins. Toggle the switch to the "On" position to begin auto-recording. As an organizer, you can also set how you want to save your recording. Save recordings in My Recordings (also known as "online recording") automatically saves, converts, and is stored to your Content Library. Save the recordings to my computer only (also known as "local recording") stores the recording on your local hard drive. You'll need to convert the recording file to a .MP4 file before sharing them with others. Note that this recording will not include any shared webcams. 10Need more help or have questions? Do you have questions or feedback for the GoToWebinar team? You can easily send those in with the integrated Help chat. Select the Chat icon in the bottom right of the screen. You can also check out this list of FAQs for any general questions. We've added an in-session chat button that you can use to give us feedback. You can also email questions to gtwredesign@logmein.com. Can I go back to the old experience of GoToWebinar? Yes. If you had an active GoToWebinar account prior to September 4, you will be able to revert back to the old experience. Click your Profile icon in the top right of the screen and click Back to the old view. This will open a new browser tab with the old GoToWebinar experience.